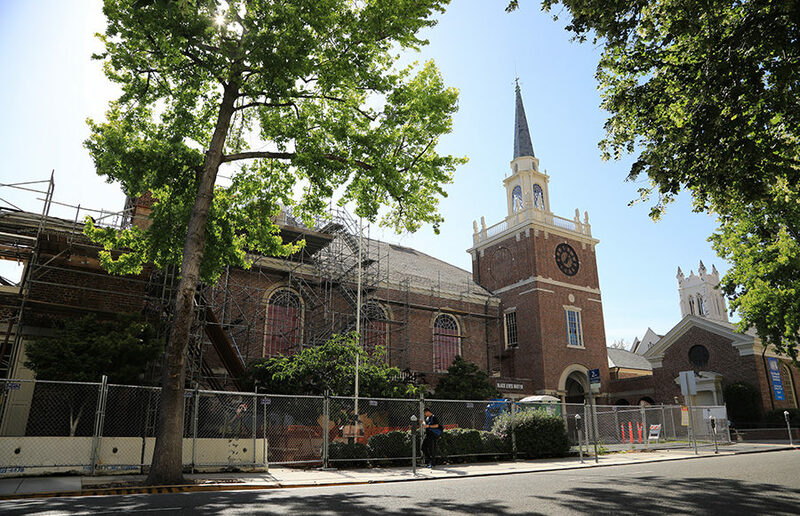 The First Congregational Church of Berkeley at 2345 Channing Way opened its doors for the first time May 21 after a massive fire last fall. The cause of the fire is still undetermined. 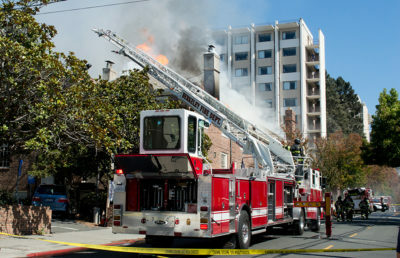 It is, however, known that the fire began on the roof of the building where construction was taking place, according to the Berkeley Fire Department Deputy Fire Chief Dave Brannigan. Brannigan said it became a “defensive fire,” meaning that they aimed to prevent it from spreading to nearby buildings. He added that the fire was completely contained by about 8 p.m. or 9 p.m.
Rachel Bauman, Minister of Community Life at the church, said she was shocked and saddened that the fire occurred, but also grateful that no one was injured. She said she was thankful for the support the church received from the community, other churches and synagogues. 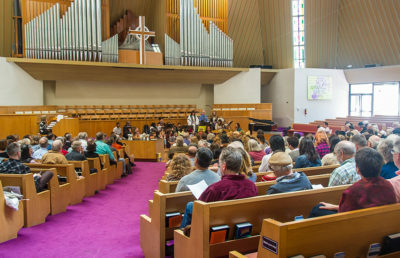 The congregation temporarily relocated to First Presbyterian Church of Berkeley on Dana Street for a few weeks to hold their Sunday services, and then moved to Congregation Beth El on Oxford Street for about seven months, according to the First Church Berkeley’s website. Although the church was damaged and members had to relocate, attendance remained consistent, according to Kit Novotny, the young adult minister at the church. Novotny said the cost of the repairs was expensive, but with the help of donations, the church has now been restored to what it was like before the fire. Pilgrim Hall, a space for children and youth in the church, was the most damaged, according to Bauman. A staff member who lived in an apartment in the hall had to relocate to an apartment Downtown. The church has designated a team of 11 members called “The Blue Sky Visioning Team” to plan the new Pilgrim Hall. The team is holding a community “in-depth conversation” June 10 to plan the “next 100 years” of the hall, according to the website. The church held a reopening celebration June 4. “It was actually the day of Pentecost, which is a holiday in the Christian tradition, and the main symbol of the Pentecost is fire,” Novotny said. The church has resumed regular Sunday service but is still in the process of determining what to rebuild. They hope to have a plan in place by the end of the summer, according to Novotny. A previous version of this article stated Dave Brannigan was the chief of the Berkeley Fire Department. In fact, Brannigan is the deputy fire chief of BFD.